A 3-hour lesson, taught by Olde City Quilts staff, will give you the basic knowledge to begin hand guided machine quilting. Lessons are $60.00 per student, 2 - 4 students per class. Each student operates their own machine. Arrangements can be made to accommodate groups or a larger number of friends. All supplies are included in the lesson fee. 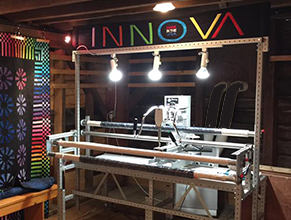 Once you've taken a lesson, you can rent our Innova longarm machines and finish your projects! Start your LongArm Quilting Career today! Rental Program Information:All renters are required to take the 3-hour Beginner Longarm lesson at Olde City Quilts. Rental is $20.00 per hour and includes some assistance and thread. Preload service is available for an additional $10.00 fee. Preloads must be dropped off 48 hours in advance of your rental time. Call the store to reserve your rental time.